Microdermabrasion is a mechanical form of exfoliation that removes unwanted dead cells and stimulates the production of healthy new skin cells via a vacuuming and abrading action. If you have never received a microdermabrasion service, the best analogy I can provide you with in regard to how it “feels” is that of having your skin suctioned and moderately sandpapered at the same time. This powerful spa service also reduces fine lines, age spots, blemishes, and scarring. It produces no downtime and offers an instant difference in texture and radiance. and stimulates the production of new healthy cells. Although crystal-spray forms of microdermabrasion are highly effective, Diamond Microdermabrasion is a superior form of microdermabrasion due to its ability to safely abrade areas around the eyes and mouth where wrinkles often form. Using a crystal-spray abrading medium near the eyes is dangerous and should be avoided. Diamond Microdermabrasion is a precise and accurate form of abrading the skin that allows for excellent exfoliation while remaining safe around the eyes, nose, and mouth. Unlike crystal-spray methods, diamond microdermabrasion can be safely performed around the delicate eye area. Microdermabrasion is a wonderful treatment and works beautifully across a wide range of skin needs. However, it is not for everyone, and it is not a magical fix. Microdermabrasion will reduce surface pigmentation, improve certain types of breakouts, smooth certain types of scars, smooth the overall texture of the skin, reduce the appearance of fine lines and wrinkles, and restore a lovely glow to the skin. Microdermabrasion cannot completely remove uneven pigmentation (we need topicals that reach down into the deeper layers of the skin to truly combat problems with pigmentation), improve inflammatory cystic forms of acne, or be performed with any level of aggression on reactive and sensitive skin types. Microdermabrasion can be performed on sensitive skin types, but never aggressively, and not with excessive frequency. If you are using prescription strength retinoid products (Retin-A, Renova, Tazorac, etc. 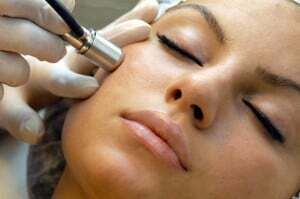 ), or any skin thinning agents, Microdermabrasion may be overly sensitizing to your skin. It is suggested that you stop use of these products 3-5 days before your service. Accutane users should not receive microdermabrasion treatments and should be off the medication a full year before receiving professional resurfacing. If you are taking blood thinners, microdermabrasion will not be a suitable or safe treatment for your skin. Individuals with poor healing capacity (brittle diabetics, auto-immune disorders, etc.) are not good candidates for aggressive resurfacing treatments. Sunburned, wind-burned skin or skin with open lesions should not be resurfaced. People with active fever blisters/cold sores should NOT receive microdermabrasion. If you have a history of fever blisters but do not have an active breakout, it is recommended that you begin anti-viral medication 3 days prior to your appointment and continue treatment 3 days after appointment. Before receiving a microdermabrasion treatment, be sure to advise your spa therapist of any condition or medication which could potentially complicate your service. It is always better to fully relate this information before your treatment (on your consultation form and your personal consultation with the therapist) than to have an adverse reaction. As a responsible spa therapist, I have been certified in multiple Microdermabrasion procedures with multiple companies, and I exercise responsible practices when performing these advanced exfoliation treatments. Improper exfoliation (too often/too agressive, etc.) degrades the integrity of the skin and leads to increased aging of the skin over time. It is important that your spa therapist understand the nature of these treatments and treats your skin like the living, breathing organ it is. My goal in the microdermabrasion service is to be progressive – not agressive – with your skin. This approach leads to better long-term outcomes and reduced irritation. Though a common practice in many day spas and medical spas, highly aggressive microdermabrasion services may be detrimental to long-term skin health. As with chemical peels and other professional spa treatments, you will protect your investment in microdermabrasion treatments by continuing the spa experience at home. I speak from experience both professional and personal when I say that what you do to your skin at home is equally as important as the professional services you receive. Professional spa treatments are your high-powered, amped up treatments that bring results and help them arrive more quickly than home treatments alone. However, what we do to our skin at home will either continue that process and make it work longer and stronger – or it will degrade the effect and often diminish it altogether. To maximize your results and extend the value of your treatments – professional spa products for home use are your answer.